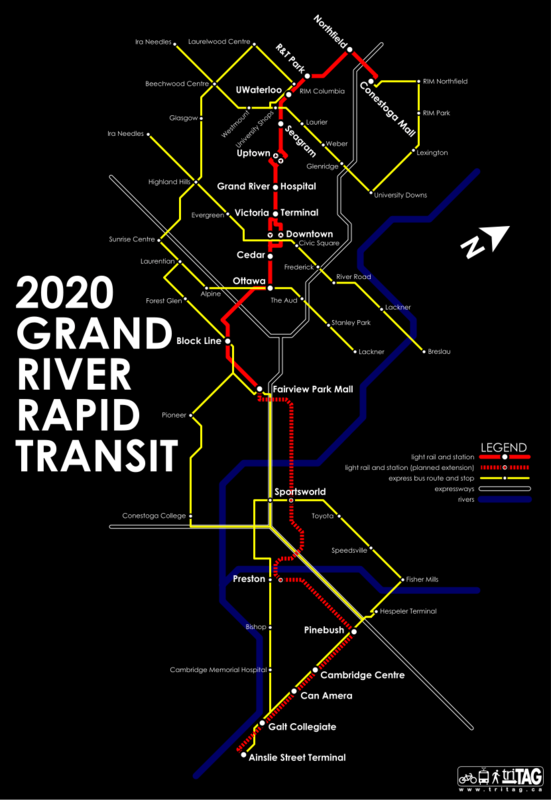 TriTAG's map of the LRT (red) and planned express bus routes. The line is more interurban than it is CBD-to-suburb. Commentary on the light rail transit project reveals a common but outdated assumption that a city should have a central business district (CBD) — an area of downtown that no one lives in, but many commute to from the suburbs. A frequent argument against the project is that downtown Kitchener isn’t a large enough CBD and that there aren’t enough people commuting in. But the whole concept of a central business district is a thing of the past, and light rail does not need a large CBD to make sense. The future lies in urban areas composed of multiple dense nodes connected by high-quality transportation — which happens to be exactly what Waterloo Region is planning for. Cities once contained housing in addition to commerce and industry. When streetcar lines were started, they moved people within the city, but they also opened up the suburbs for residential development that promised tranquility and fresh air. Later, the availability of cars and cheap fuel together with massive post-war highway and road development led to suburban flight on a larger scale. Commerce also followed the highways and set up shop in suburban malls. Only jobs remained, producing the classic CBD — where commuters stay from 9 to 5, leaving an empty city every evening. But those long commutes aren’t healthy for our cities, and an office monoculture is not conducive to urban living. Most of Waterloo Region’s growth has occurred after the post-war years, and many jobs are located in suburban office parks. So we have no reason to cling to the notion of a CBD — it just doesn’t apply. But that’s not a bad thing. Instead of jobs clustering in any single downtown, many destinations and much employment have fortunately clustered along a reasonably dense linear corridor. In an earlier post I suggested the utility bicycle shop as a sound business idea and a good way of lowering the barriers to cycling as transportation. As I’ve found out more about utility bike availability in North America, it struck me that most such shops had only recently opened. To see whether this was true, I searched out every North American bicycle store I could find that has a strong current focus on utility bicycles and bikes as transportation. The answer turns out to be a resounding yes. Below are the shops ordered by founding year. Shops marked with a * build, design, or special-order their bikes. (Curbside gets a star for starting a major distribution company and helping design the Batavus Fryslan and Breukelen.) I think the number of shops doing their own thing is partially a consequence of major North American bike companies long ago abandoning utility bicycles. That said, in addition to the growing number of imported brands, some smaller North American bike companies do now focus on city bikes and utility: Electra (founded in 1993), Xtracycle (1998), Breezer (2002), Yuba (2006), Civia (2007), Madsen (2008), and Linus (2009). For that matter, new European manufacturers of city bikes have also been setting up shop, including Azor (1998), Retrovelo (2003), WorkCycles (2003), De Fietsfabriek (2003), and Velorbis (2005). 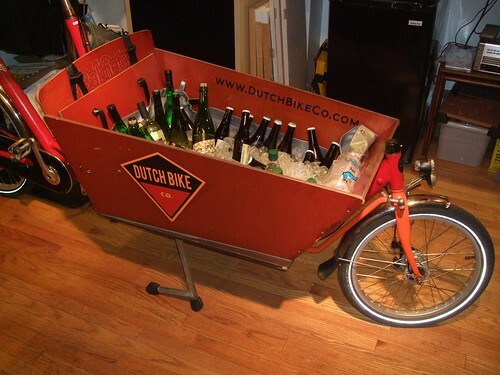 Interestingly, both WorkCycles and De Fietsfabriek were started in Amsterdam by Americans. Utility bicycles really are exploding in popularity, despite (or maybe thanks to) the recession. And it’s not just the bikes, but also the inviting “slow bicycling” that goes along with them, the ever-more-frequent calls for dedicated cycling infrastructure and buffered bike paths, and the rapid spread of bike-sharing schemes (which of course use utility bicycles). So expect to see more city bikes coming to your town. And if you want to see them sooner, now’s the time to open up a bike shop and get more regular people riding (and demanding cycling infrastructure). The streetcars that crisscrossed North American cities and towns in the late 19th and early 20th centuries were generally built and run by private companies, and operated at a profit. With the rise of the private automobile and due to other factors, they were no longer able to turn a profit, even in the cities in which streetcars were not deliberately run into the ground. I don’t think cities realized at that time that the infrastructure of the streetcar lines may have actually been worth paying for — and not just something to be allowed if paid the usage fees by streetcar companies. And so the infrastructure was swept away with the streetcars, which paved the way (no pun intended) for the downturn of urban areas and boosted suburb development. The other side of transit is infrastructure. Transit infrastructure, generally rail-based, changes the fabric of its surroundings. It transforms the geography, and attracts disproportionate development to its stations or corridors. Once built, it is taken as a permanent and reliable connection and short-cut between disparate places. It is visibly in place, a financial and social investment that is both useful and that cannot be easily picked up and moved. In other words, it is infrastructure. And such infrastructure is central to reclaiming an urban landscape. We should stop talking about just transit, and start talking about transit infrastructure. The way discussions are framed makes a difference, and currently discussion about transit allows the ignorance of all the implications of transit beyond the movement of people. The only way to build liveable cities in North America that are not car-dependent is by building strong transit infrastructure. Transit can only follow, while transit infrastructure leads.